I have again been neglecting the blogging, but all quiet on the social media usually means I am ridiculously busy, rather than I haven’t been doing anything new. The recent updates are that in a few days I will be a qualified Divemaster, which I have been spending most of the last few months training for. 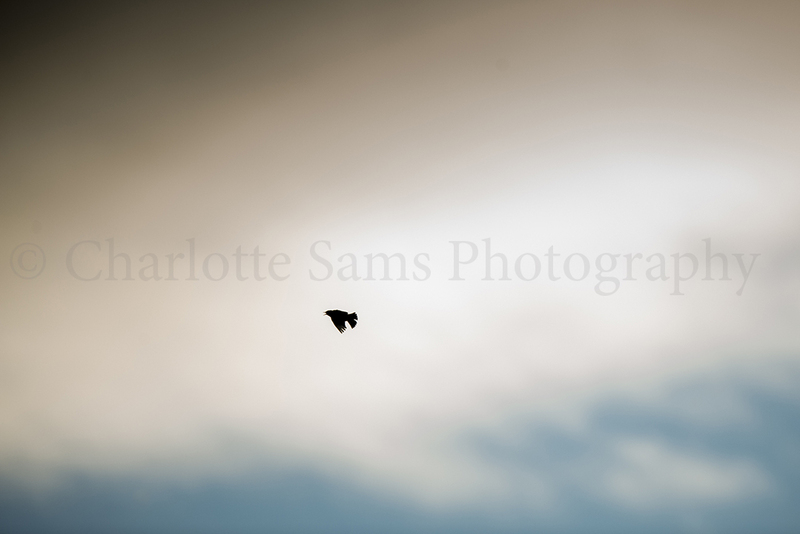 I also found out last week that I have been awarded an environmental bursary from the Royal Photographic Society, which is going to allow me to pursue and document a project which I feel very passionately about. I will be telling the story of the Marine Conservation Zones, and am so grateful for this opportunity to cover a subject I have been wanting to for so long. I will discuss this project further later on, when it gets underway in a month or so. I’m also off to China in 3 weeks, with my fellow recent graduates and a couple of our lecturers, to work on a collaborative project with a university in Beijing, and also teach some photography workshops. So, it’s all very exciting and busy! However, the main purpose of this post was to share some images from a couple of months ago. 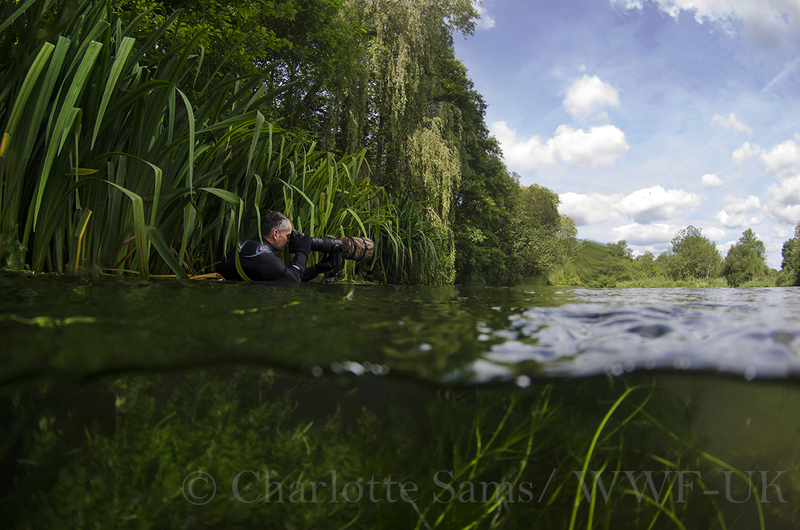 I was commissioned by WWF-UK to document some underwater imagery of a particular chalk stream/river. I also had the pleasure of working alongside the awesome Andrew Parkinson, who had been commissioned to do the topside imagery, and who I must thank for recommending me for the project in the first place! 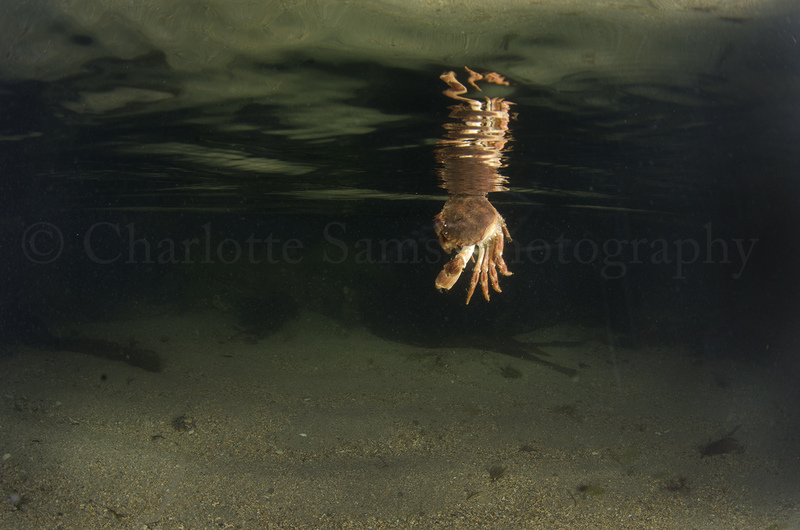 I won’t lie, I was pretty nervous about this project, because although I’m very comfotable working underwater, freshwater is an environment where I had limited experience, and the rules of underwater photography differ a little between freshwater and marine environments. I was only shooting for a few days, but I think I still took around 3000 images! So obviously I can’t share them all but I would like to talk about a few. 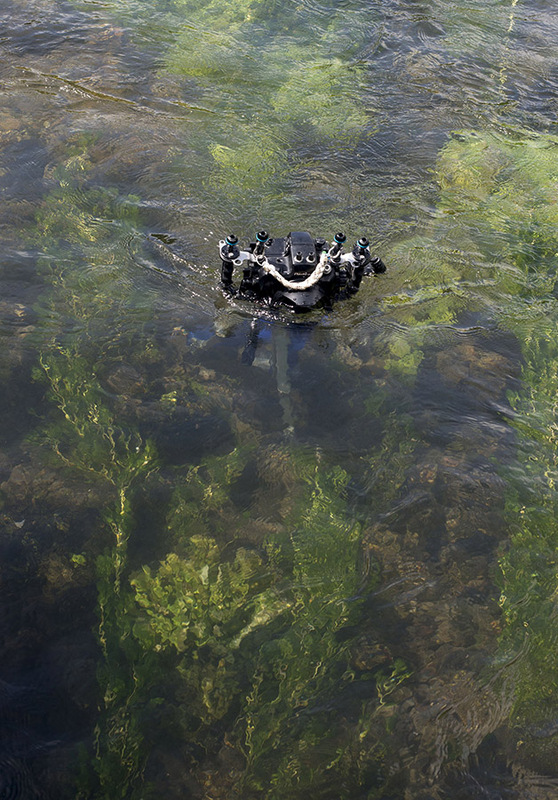 The main trials I encountered at first was the finding of the species; various fish etc. 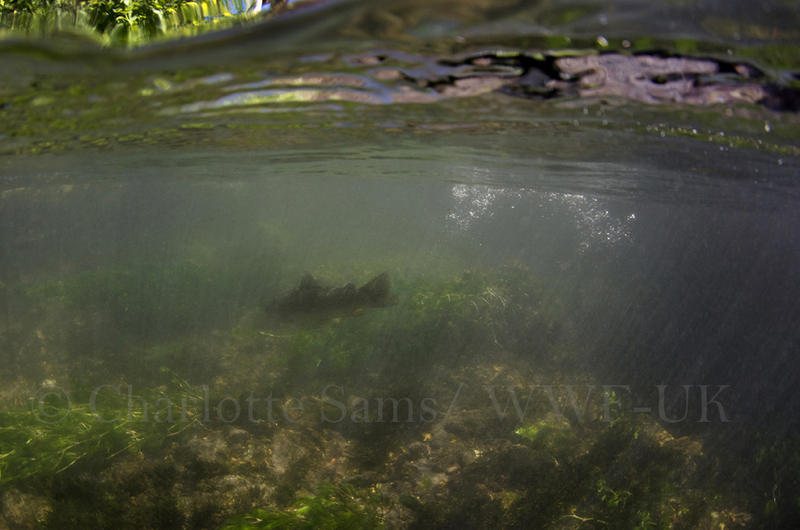 Even when finding some of the fish, photographing them is a huge challenge in itself without the use of a pole camera. One of my set-ups was the image below, which involved the camera, in it’s housing, on a tripod where there were Trout upstream, the shutter set to interval, and myself on a bridge above, attempting to bait the Trout close to the camera with bread. 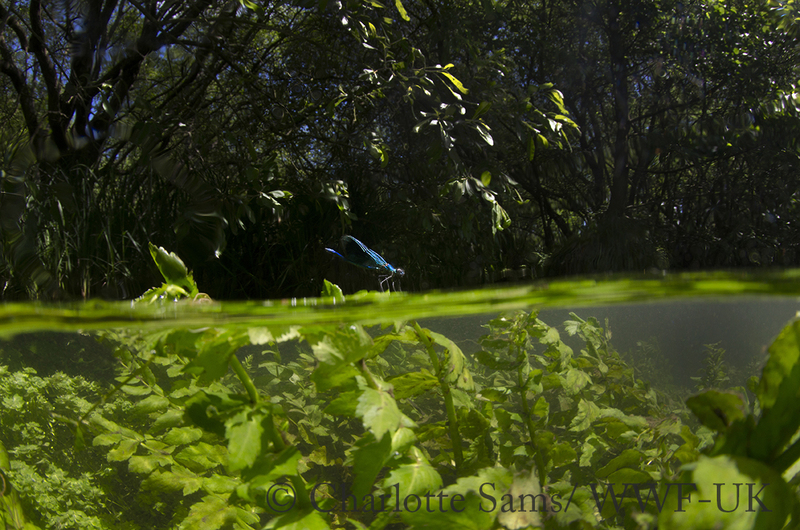 This shot of the banded demoiselle is one I had visualised since the recce of the site; watching these damselflies for a while you notice how they land for a little while on anything floating in the water, and as I was in the water, I tried stalking them. Most of the time this didn’t work, as they only settle for a minute, and flew off when I got too close, but I had one successful shot, which I am pretty happy with, especially considering it’s taken with a 10-17mm fisheye lens, so you can imagine how close I really had to be! 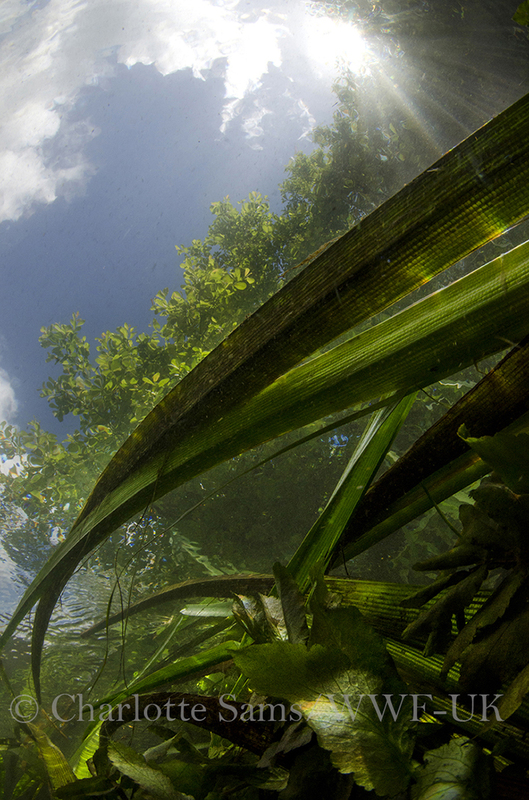 This is one of the more creative images I took, there’s a few more in this kind of style, conveying the “underwater Amazon” as this river had been aptly named. The reeds made a good subject, with their jagged shape, but actually most of the time I was shooting like this I couldn’t see the viewfinder, as I was holding the camera upwards, so it was a little hit and miss sometimes, and again a lot of preserving and repeating of the same shot. 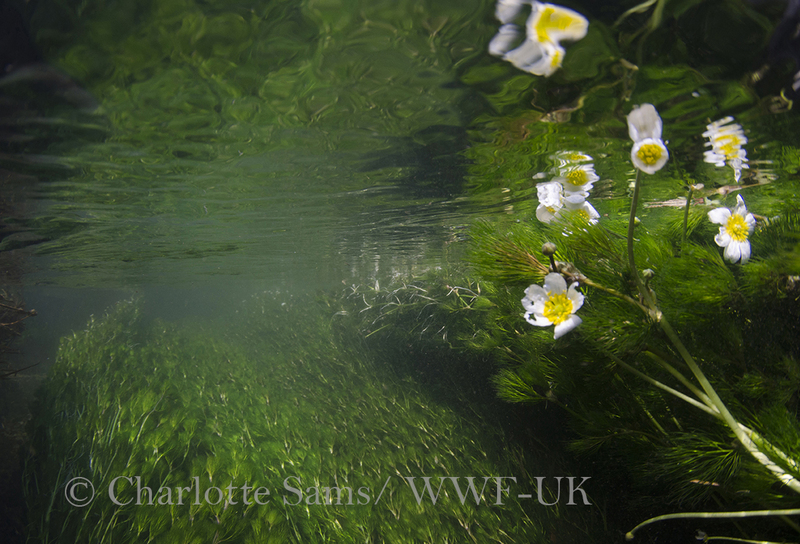 A last image for this post is this water crowfoot, shown from underwater. I was attempting to capture the reflection in the water level, reflections are great to work with, and I love the sheer amount of green in this particular shot! 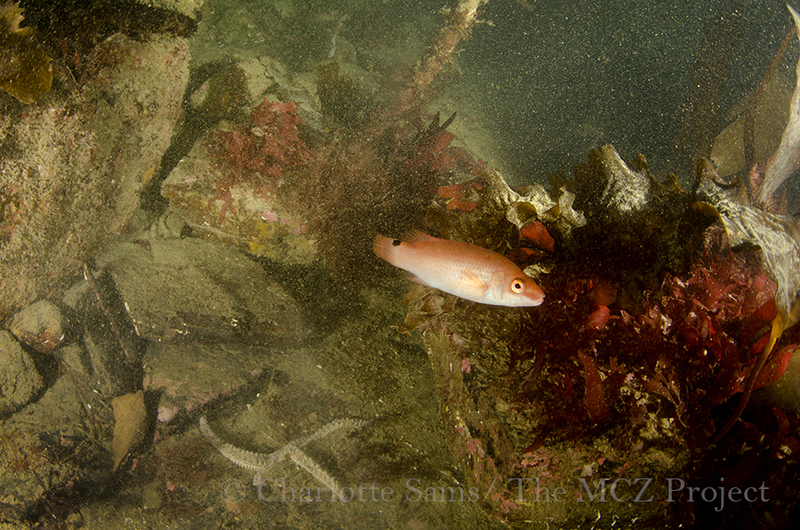 These flowers are common around habitats like this, and add a little colour to these underwater scenes. Now that I’ve finished my degree, and my latest project, I wanted to have a bit of a play with some different underwater/marine photography before I start the next one. Rockpool photography is something that I haven’t done enough of, it’s the kind of thing that seems like it’s easy until you actually try it. It’s not easy, you find yourself contorting into strange positions to try and angle the camera and strobes, and half the time you’re blind shooting because you can’t see the LCD screen or through the viewfinder. 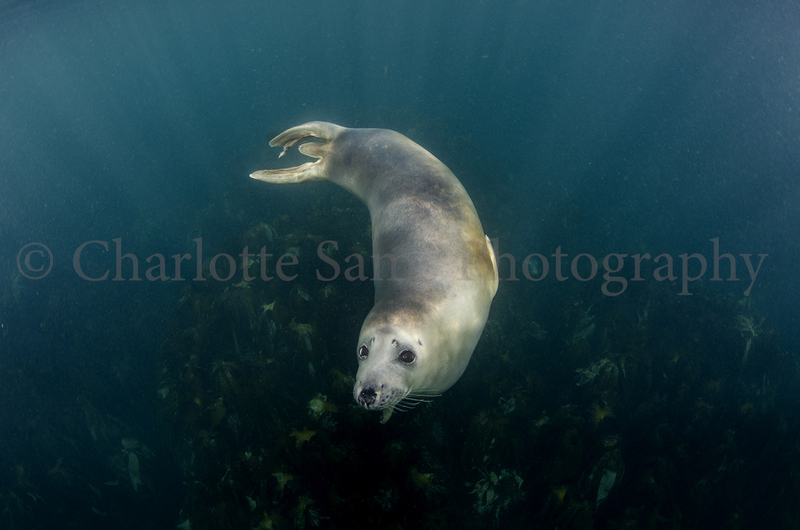 I may even go so far to say underwater photography whilst diving is easier, (sometimes). Having said this, it’s also really fun. You get to paddle around in water and find fish and crustaceans and simply spend time at the coast. So, I spent a little while doing just this. I’ll admit it wasn’t the greatest day for species sightings, my eyes weren’t on it today, but I was more enjoying just being there than looking for small creatures. 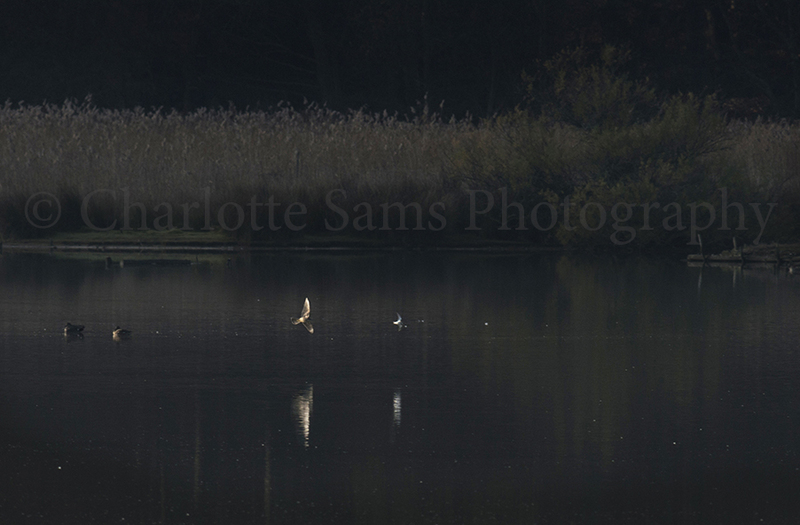 I absolutely love the colours in this first image; the yellow appearing almost golden. This images are all proof of the fantastic colours in British seas, and the importance of using strobes to highlight these amazing natural colours! A strawberry anemone, Actinia fragacea, here clings to an underside of the rock. 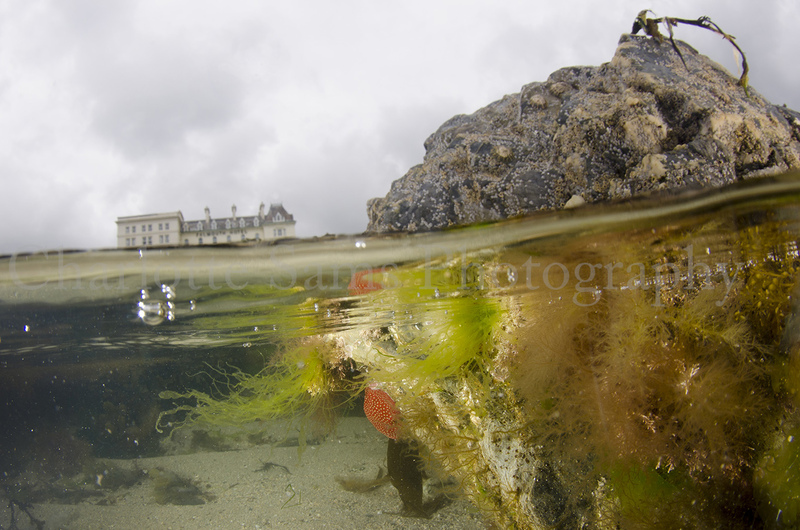 I enjoy using the water surface as a mirror, creating more colour within the images. Strawberry anemones are very common, and I saw plenty of them today, they are usually bigger than beadlet anemones and on this particular site, located nearer to the sea than some of the other anemone species which were more prevalent further up the intertidal zone. I found a dead edible crab, Cancer pagurus. It was actually floating on the water like this, I promise I didn’t put it there! But I was very grateful that it was still fresh enough to float, because it allowed me to experiment even more with reflections. 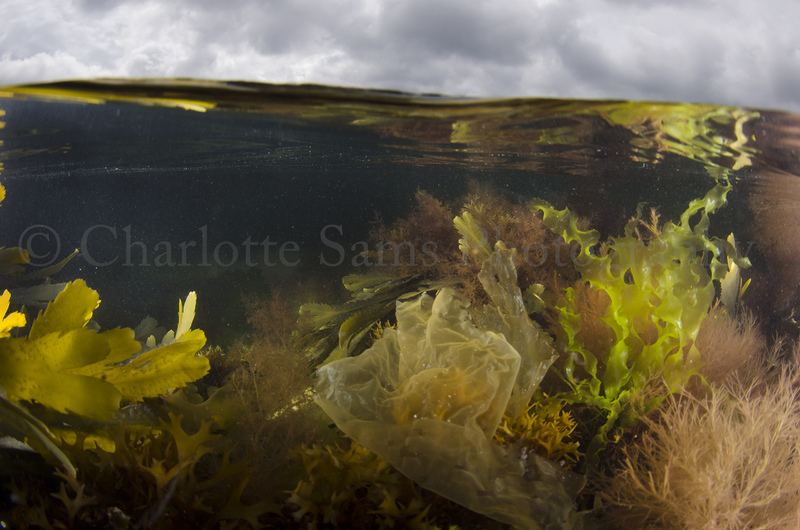 I often lean towards creating darker images (see above as an example), but I did want to convey how bright and beautiful the seaweeds were in these images too, and the yellows blend pleasingly with the touch of green-blue water here. 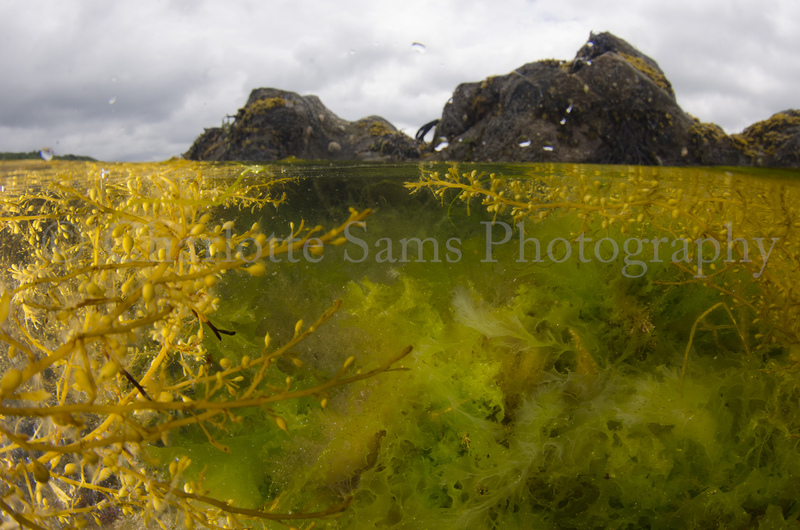 So I may not have found many animals today, but lots of species of seaweed! A fish or a mollusc may have added a bit more to these photographs, and I’ll work on that in the future, I think the simplicity of this composition still works well. Floating crab #2. 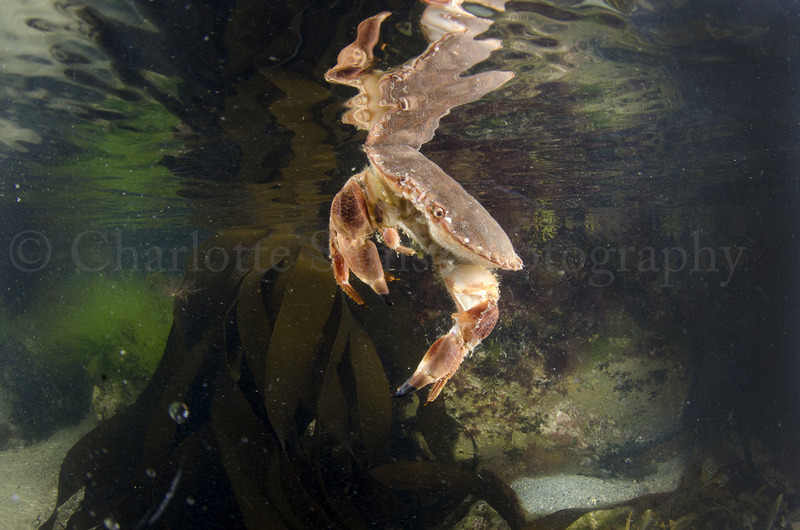 A little more colour in this one by using a wider aperture, and a rather cross eyed looking crab in my opinion. 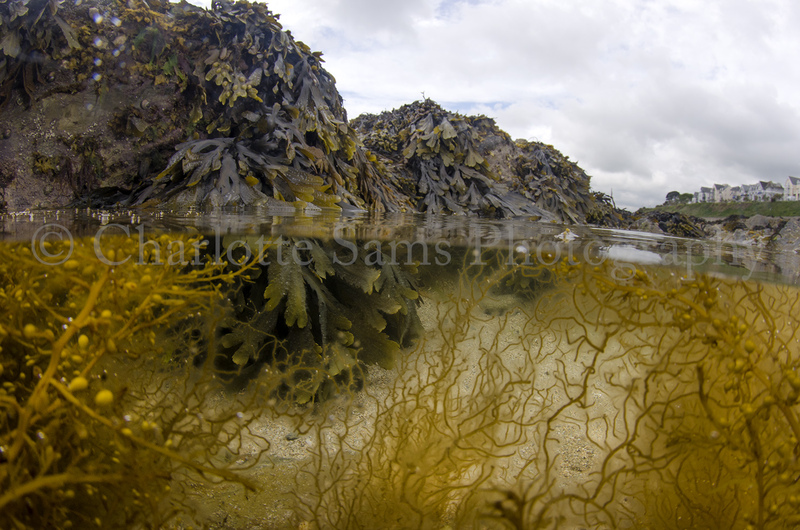 This image was my attempt to convey the lovely curls of the underwater seaweed, and kind of my interpretation of the pool. It shows a good comparison between the topside and underwater worlds. Personally I think the underwater side looks much more appealing! 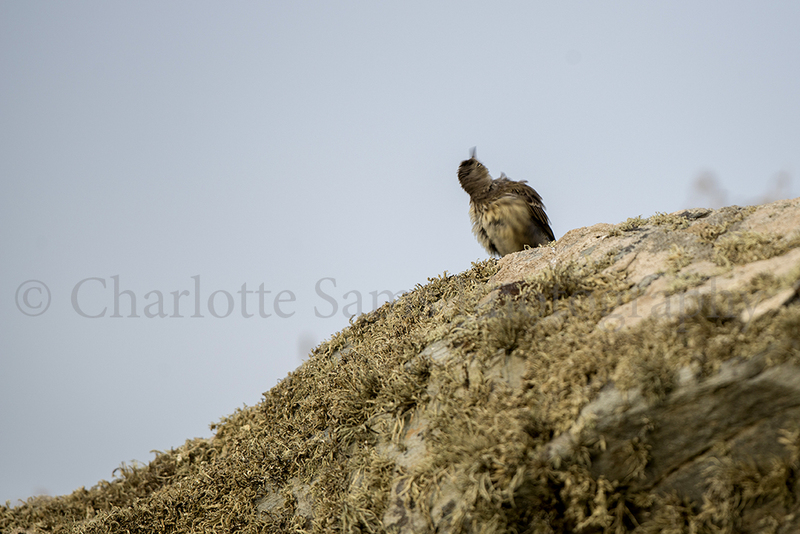 This week, I was really excited about working with a team of other young conservationists/photographers/and general wildlife fans! 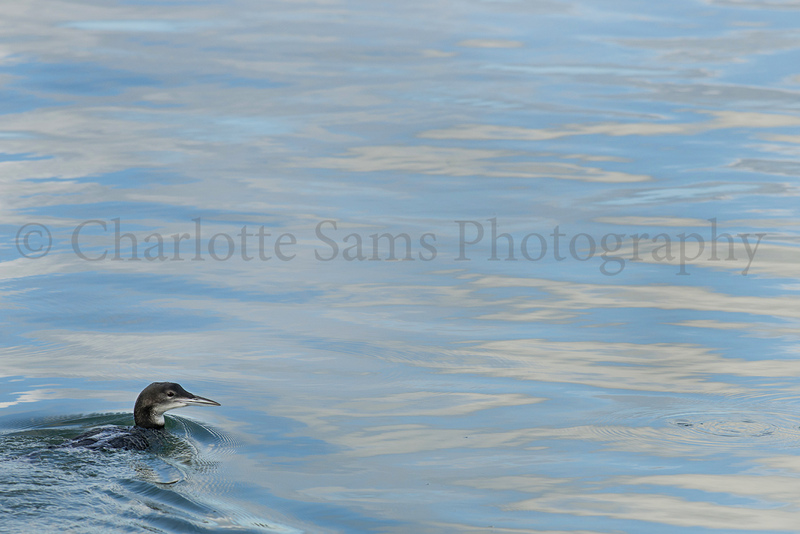 Connected by A Focus on Nature, our plan was to work together, and with Birds of Poole Harbour, documenting the various species and wildlife we saw on our boat trip around Brownsea Island and the harbour. 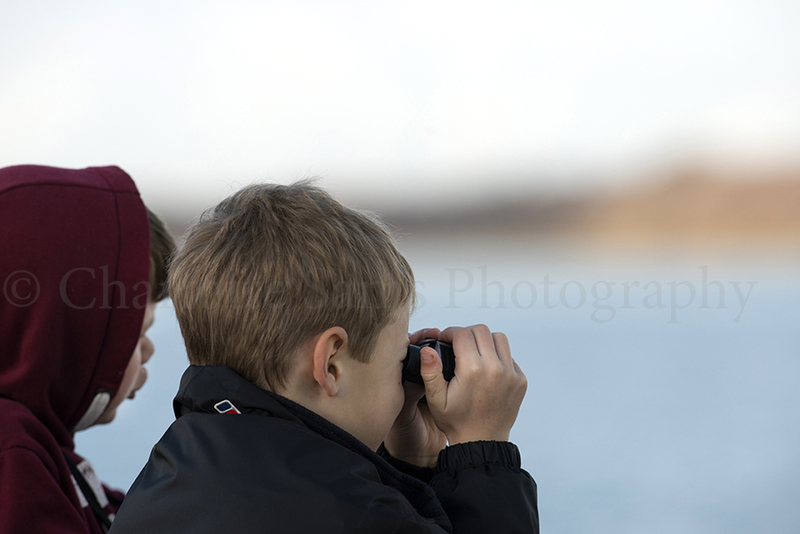 Accompanied also with children from Stoughborough primary school on our morning boat adventure, our other task was to engage with the children in various activities that afternoon, relating to what we may have just seen and learned on the morning’s bird watching boat trip. 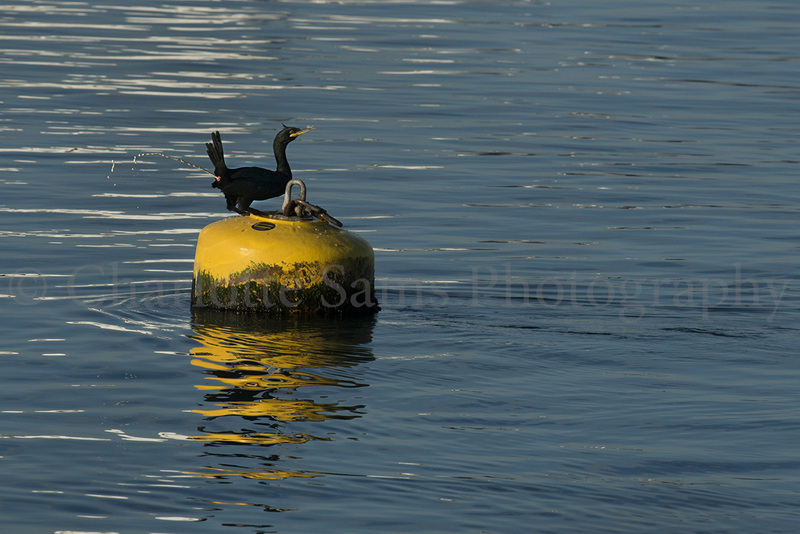 However, this post will focus on images taken on the boat. 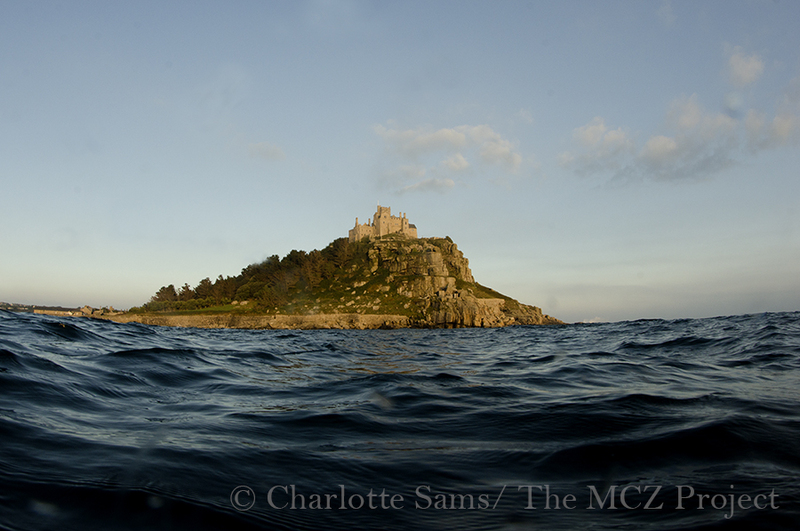 We were extremely lucky with the weather this day, it couldn’t have been more perfect for being out upon the water! The waters could not have been calmer, and there was a gentle warmth from the sun, evading the clouds in the sky. 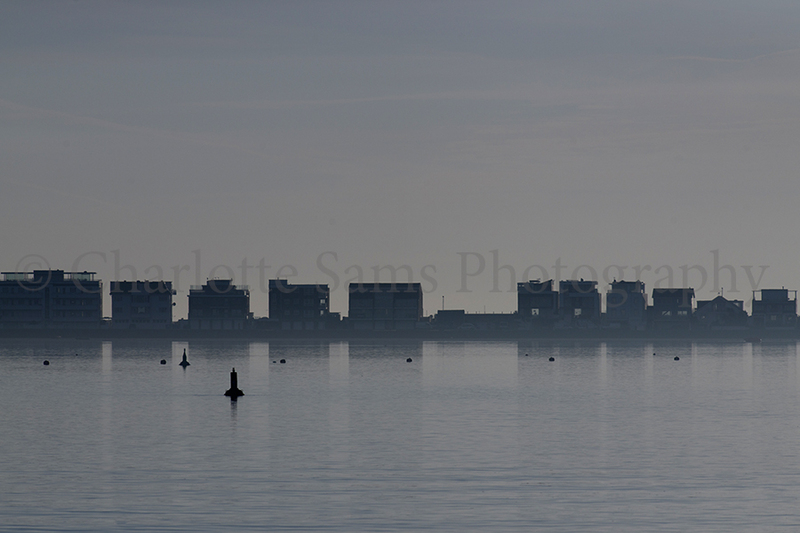 This first shot, although not wildlife, shows the beautiful misty, calm weather we had, and the view looking over towards sandbanks. 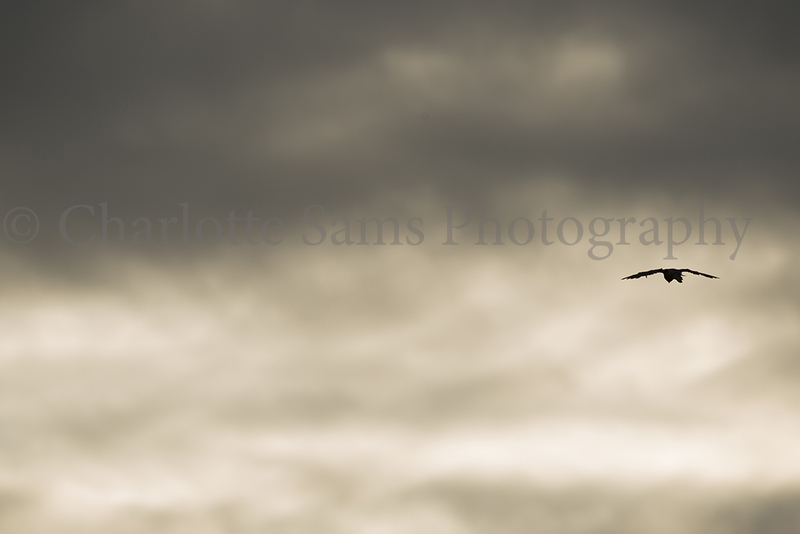 This image is included for the humorous value, I’m pretty happy with the timing of it! 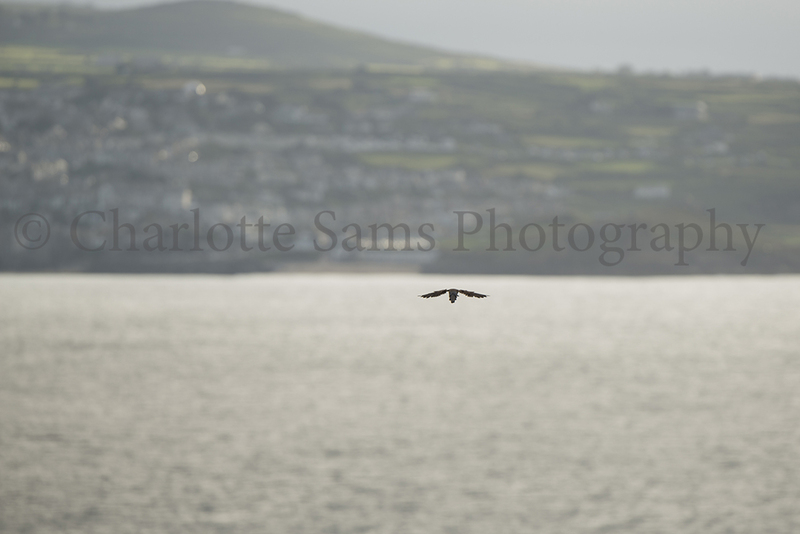 (click on the image to view it larger) We had a lot of cormorant sightings throughout the trip, some of the children made a competition of seeing who could count the most of them! 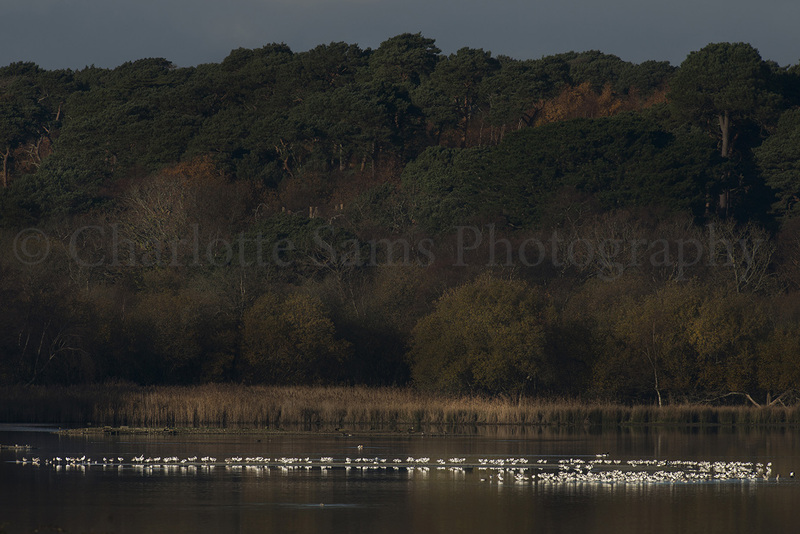 This is an image taken from the boat looking over towards the lagoon area on Brownsea island, with a huge flock of Avocet feeding and gathered in the shallow waters. Avocet are simply beautiful birds, I would have liked to have taken a close up of one of them but unfortunately there were just too far away. 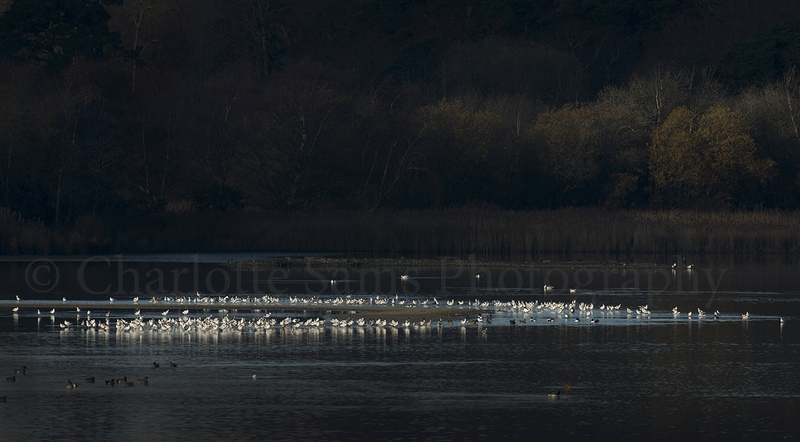 However what I do like about the images I did manage to take is that they display the habitats of the birds instead. 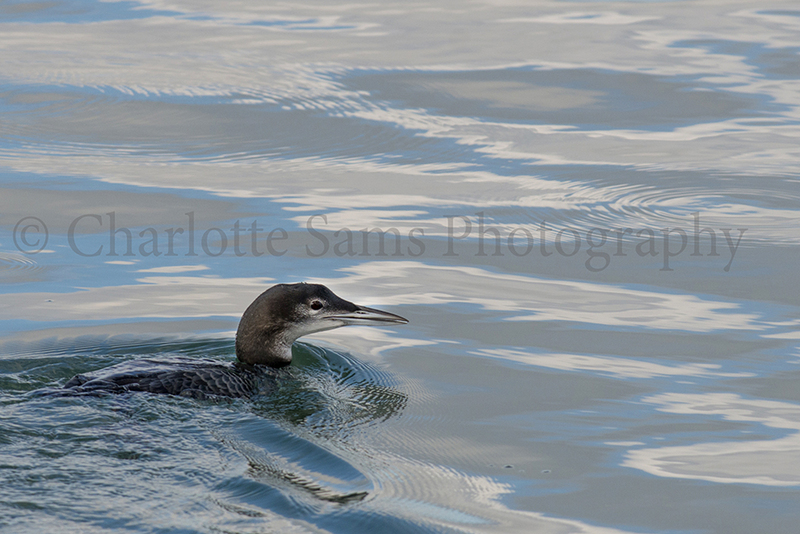 A Northern Diver decided to pop up very close to us on the boat, and I was able to take these next two images. We wouldn’t have had this lovely pattern on the waters should the weather not been so calm. Some more Avocet on the lagoon again, I love that the stillness of the waters creates such strong reflections of the various birds in this particular habitat. Another wonderful bird we saw a number of; the Spoonbill! This photograph is of a small group of them feeding, though there were many more than this in the area. 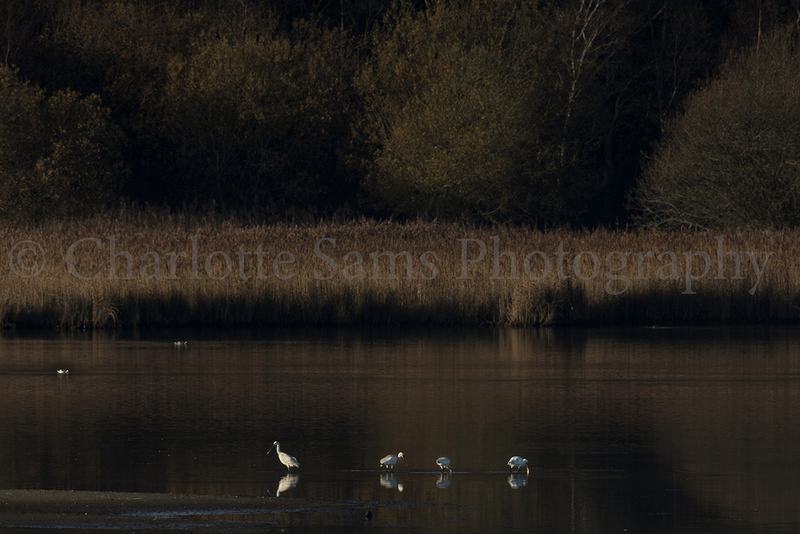 Spoonbills are not the most common wading bird so this was an exciting sight for the children, and for myself too! And now for the absolute highlight of the boat trip! 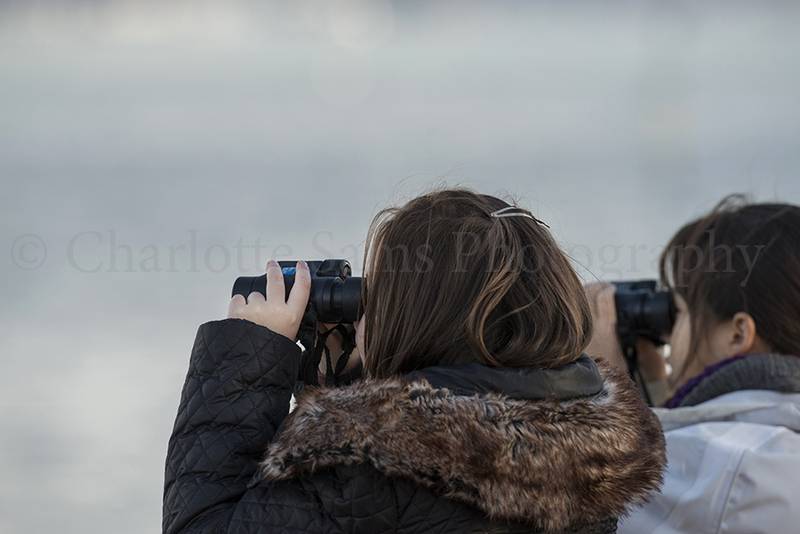 Some of us were treated to the sighting of a hunt and kill sequence, involving a Merlin and a flock of Dunlin. This was incredible to watch, I’d not seen anything like this before. 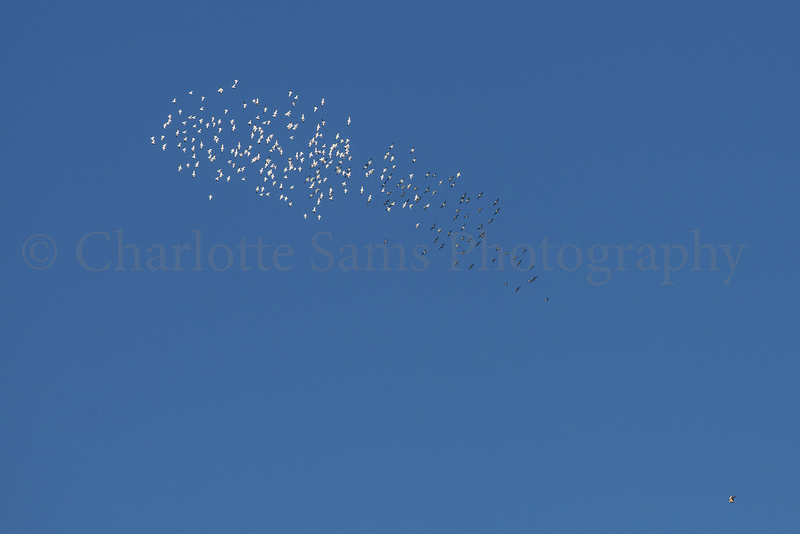 The speed of the Merlin was so impressive, and as it whipped around this flock of a fair few Dunlin it was hard to track! The Merlin in this image is in the lower right corner, you can see here the Dunlin tried change direction multiple times to escape it. The group is slowly starting to break by this point, and spread out a little further. The birds flew so high that I actually lost sight of them, but suddenly reappeared, and the Merlin had succeeded in picking one Dunlin off from the group. The chase continued again, with the Merlin and now just one Dunlin flying across the corner of the lagoon. This action continued again for possibly a couple of minutes, until the Dunlin flew over the reedbed, and we lost track of the pair. The Merlin soon materialised above the reeds, clutching within it’s talons the unfortunate now deceased Dunlin. 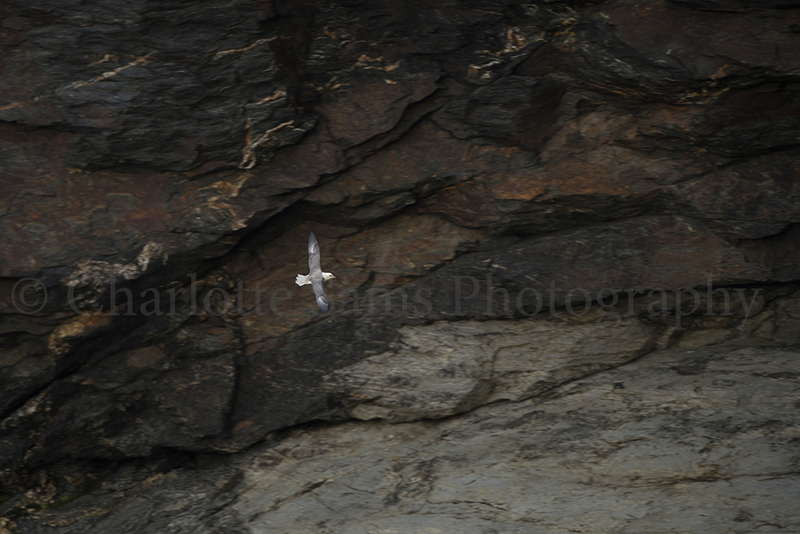 I didn’t manage to capture this in a photograph, and the Merlin swiftly flew off. This whole sequence lasted really only a matter of minutes, a prime example of the Merlin’s expert hunting skills, and I am extremely happy that I was there to witness it! So thank you to my fellow project team and everyone involved for a wonderful day! So here is the video I mentioned earlier, I won’t talk about it much as I’ve already done a post on the same snorkelling with seals trip. Filmed with a Nikon D7000, Tokina 10-17mm lens, and Nauticam housing. 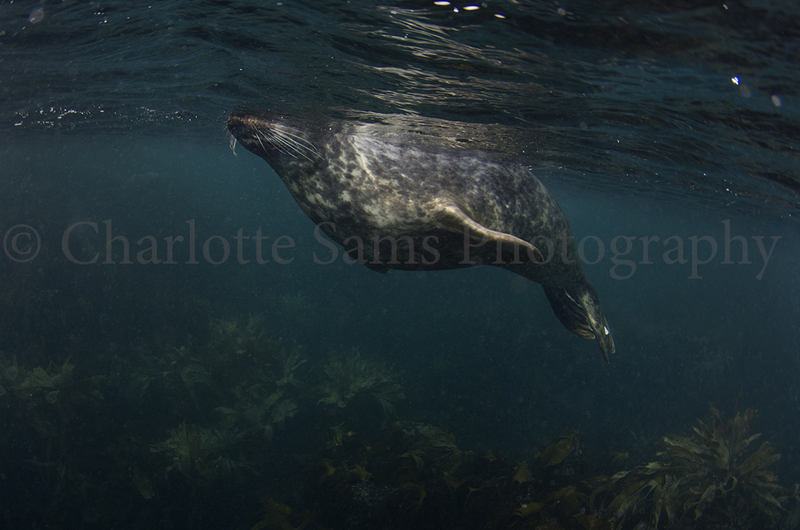 Whilst on the scillies, we had booked onto a snorkelling with seals trip. There are a fairly large number of grey seals around these islands, particularly on the Eastern Isles, and most of them are very curious and playful. 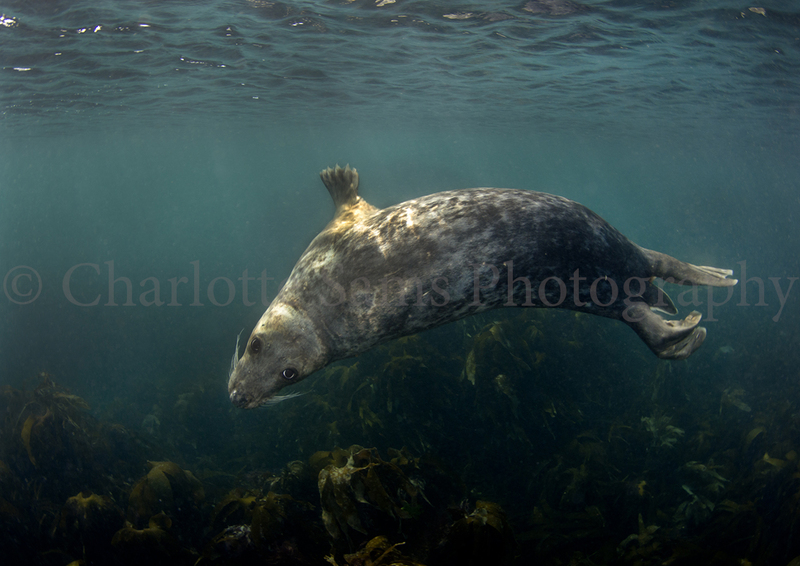 It was an incredible experience to be in the water with these mammals; they have a tendency to sneak up behind you and watch you for a few moments without you realising, and then you turn around and there’s a seal on your fins! I took more video than still imagery on this trip, but I will post the video up later on this week when I’ve worked on it a bit more. Therefore, this is just a few images that convey the seals and their playful attitudes. Switching from diving to snorkelling was something I was unused to, and so should probably practice snorkelling more! As I’m used to diving, I kept forgetting that I couldn’t do all my usual manoeuvres whilst filming without getting seawater in my snorkel, which was interesting to say the least. It was also strange floating on the surface looking down on the subject rather than from the seabed looking up. It’s good to change perspectives, though I would love to have the opportunity in the future to actually dive or freedive with these animals, to be able to work eye level with them in their world. 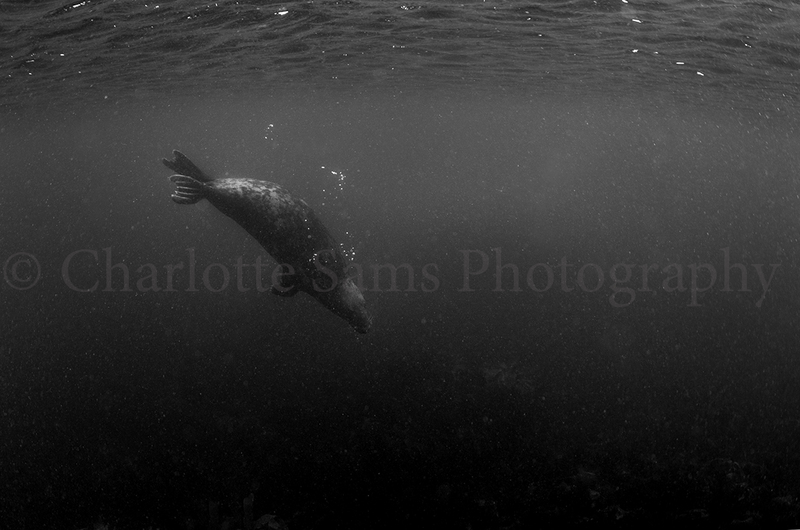 This first one is a fairly humorous photo of a faceless seal, quite calmly floating at the water surface. The white tag on it’s tail flippers is just visible; this means it has been one that has been rescued, rehabilitated, and then released by the Cornwall Seal Sanctuary in Gweek. It’s lovely to see these seals living so well in the wild after having a poor start in life or attaining various injuries. I just wanted to include this one to show the beautiful sunny day we had. 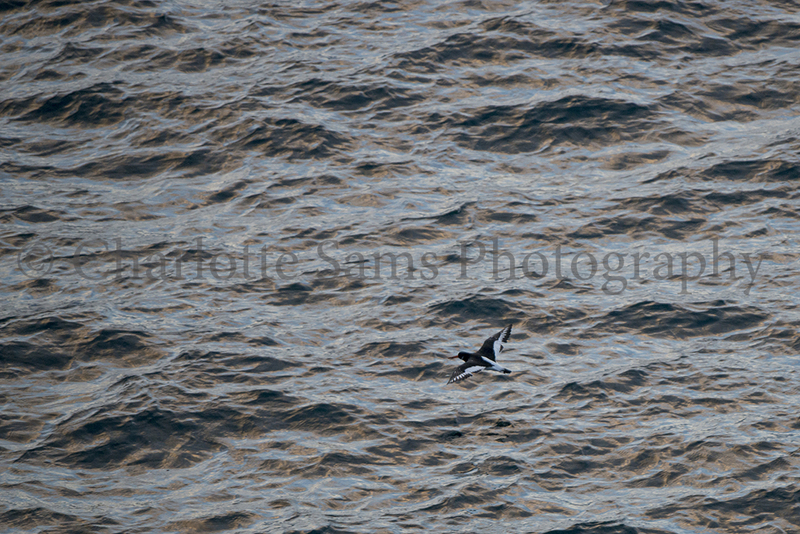 If only I had been closer to the seal and got it’s head in view as well! 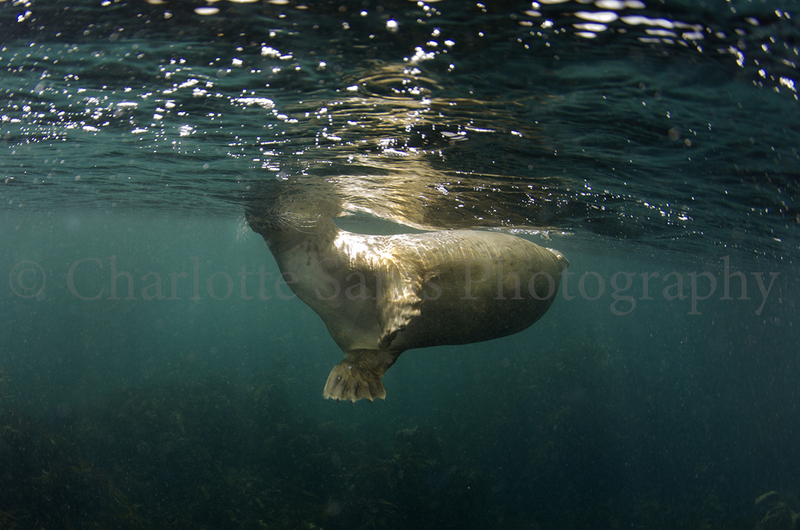 Seal acrobatics, a common sight whilst in the water. The kelp forest is visible in this shot too. 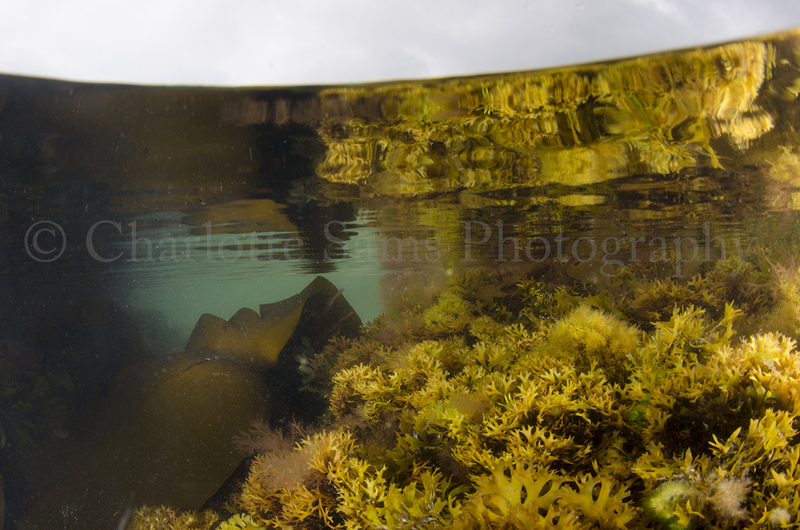 Though the water wasn’t particularly deep, it was covered with kelp. The seals liked to hide within the knots and tangles. I loved the light rays through the water in this image, although I feel the composition isn’t as strong as it could be. I also love the light dancing on the seal’s head and back. 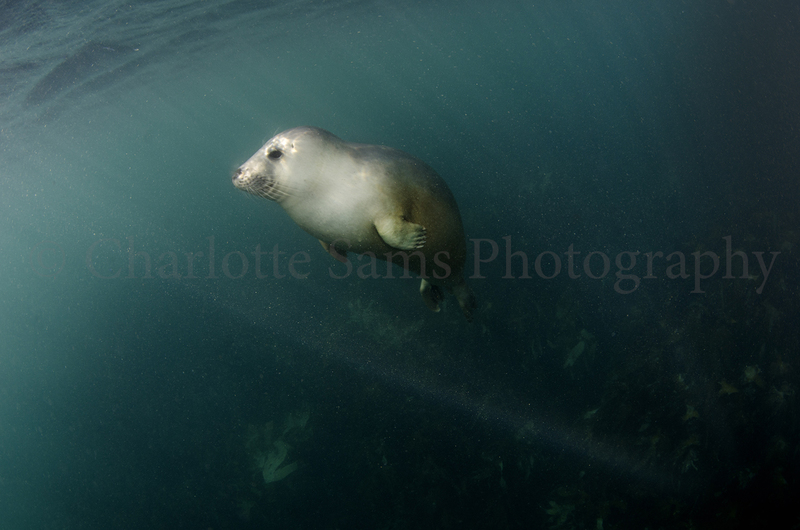 This grey seal appeared to enjoy blowing bubbles, as my video will also show later. I wanted to go for the grainy film look edit with this image, as because of the distance from the camera and strobes the colours weren’t particularly striking. 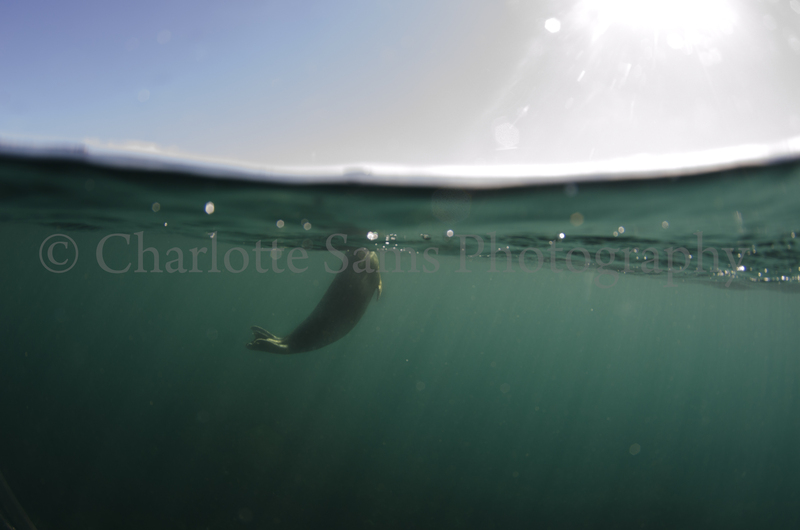 Another faceless seal, this image demonstrates the use of their flippers to pull their pretty weighty bodies through the water. And probably my favourite still from the trip; the young female surrounded by light rays looking right up at me, wonderful. 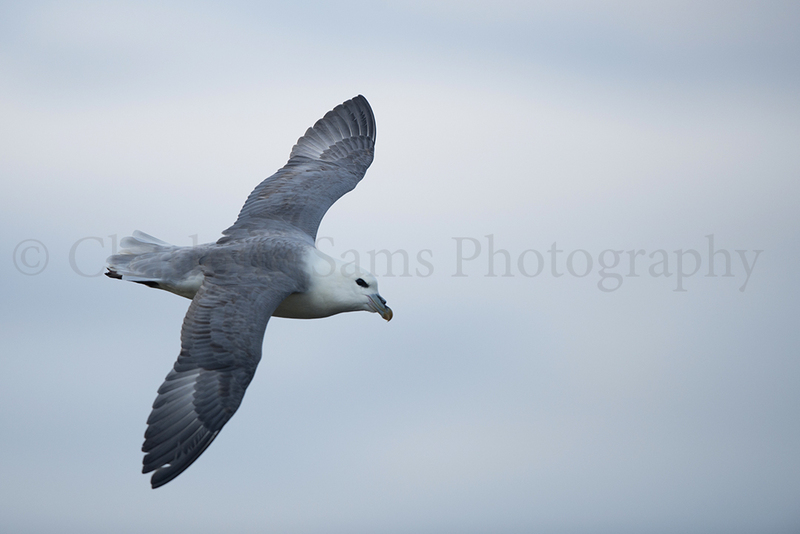 I took a break from underwater work, and took out a long lens for some bird photography around Godrevy area. North Cornwall coastline is beautiful, especially the headland round Godrevy so it’s great just to visit there, even better with a camera! As usual we saw a few grey seals there, (if that’s what you’re after it’s the best place in kernow to see them) but I’m going to wait until pup season before I try photograph them again. 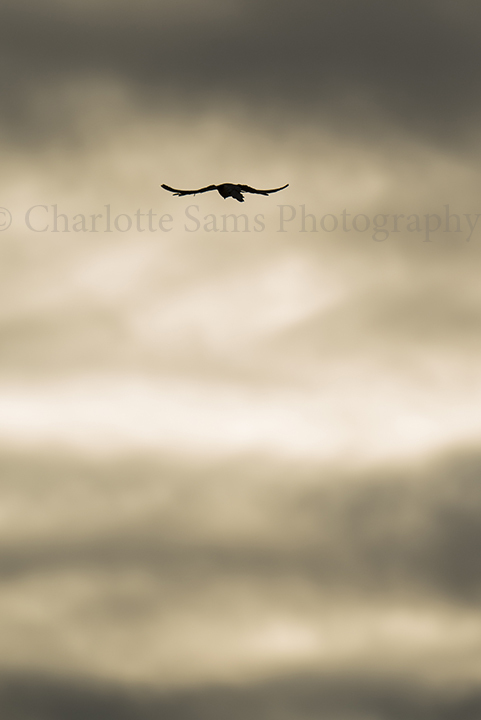 There’s almost always a kestrel flying around the headland somewhere, but I don’t actually have a great deal of kestrel images, despite them being one of our most common birds of prey, so I was happy to take a few photos of this female here. And this image shows St Ives in the background, I included it to give context to those who aren’t familiar with the area. 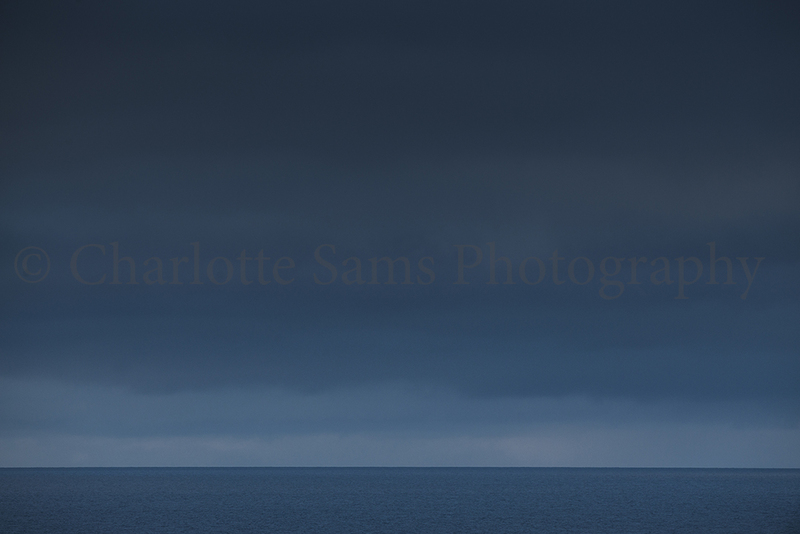 St Ives is probably only a few miles across from the headland where I was, it looks even closer here.